This single storey cottage, once home to a Gosney family, was situated on Dale Street. It is now the site of a row of domestic garages. Eastwood Terrace can be seen at right rear. Nelly's Well itself, can be seen on the 1851 Ordnance Survey map of Ossett, and stood closer to Dale Street than the cottage. In more recent times (1950s) the disused well was covered by Yorkshire flagstones. Most of the other buildings seen here in one of Douglas Brammer's most recent sketches still stand today. 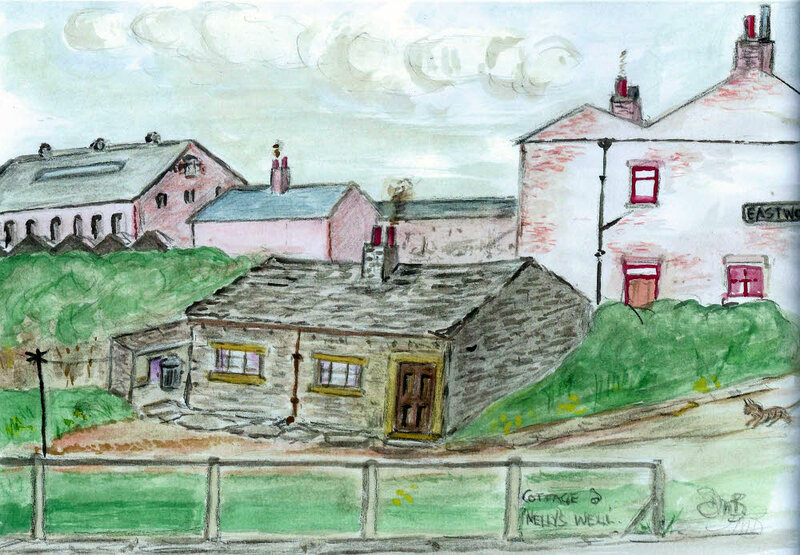 The mill building (Denton's) to the left rear was used as a barracks in WWII and had targets painted on the external walls for firing practice.